As your boat is likely to be much smaller than a conventional house in terms of the size and number of its rooms or living spaces, you’d think that it would be easier to keep it clean. However, because even the interior of a boat can be exposed to elements connected to the natural environment and because of the importance of cleaning to certain parts of the exterior of your boat, it might not necessarily be the case that keeping a boat clean is easier than keeping a house clean. Just like with a house, you’ll want your boat’s interior to both look and smell clean and attractive. You’ll be walking from the deck (and wherever you may have walked before that) straight into the interior so you’ll need to vacuum on a regular basis, even more so if you have pets and children. You should occasionally polish wooden floors and all other wooden and metal fixtures and fittings and remember to clean windows and blinds as well as any curtains and upholstery. Your galley and any separate eating area should also be kept clean not purely just for hygiene reasons but if you don’t keep on top of this area in particular, it will attract bugs, termites and harbour bacteria. Toilets need to be kept clean and, perhaps even more importantly, kept as odour free as possible. Grinding fresh lemons or having freshly scented flowers or jars of pot pourri on board will improve the smell of the interior of your boat as will keeping hatches and portholes open to allow for ventilation when the weather permits it. Rubbish disposal needs to be carefully managed and considered as well as odours caused by certain foods, dampness, pets and smokers. Washing the boat’s exterior is also important not just for its appearance and cleanliness but more significantly, perhaps, because it helps towards keeping it well maintained. A regular weekly wash down will keep your boat operating efficiently and is even more important if it’s a sea faring craft which is exposed to saltwater. As the exterior of boats can be manufactured from a variety of materials including wood, metal, canvas and fibreglass, it’s important that you use the correct cleaning fluids for the specific materials you’re cleaning or if you’re unsure, simply use a mild detergent. The exterior of the boat is going to be exposed to the sun, rain, water, salt and grime as a result of the weather and other outdoors elements and from walking about the boat and this all eventually leads to grime running down the side of the boat’s exterior leaving streaks all over the ship’s hull. In fact, the hull is probably the most important part of the boat’s exterior to keep clean, yet it is often the most overlooked. Not only is it affected by the dirt and the elements but, over time, algae, barnacles and all sorts of other kinds of marine life will attach itself to the hull which should be cleaned and inspected regularly as not only can it cause damage, it also hinders performance. Furthermore, if you intend the selling the boat one day, a poorly kept hull will devalue the boat far more than one the same age which has been well maintained and cleaned. 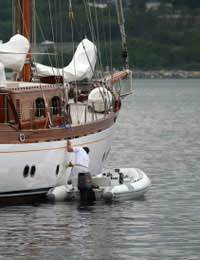 There is another article on this website connected with boat maintenance and, should the thought of all this cleaning put you off boating, remember that if you moor up in a marina or harbour, there are specialist boat cleaning and maintenance companies who can take much of the dirty work off your hands for a price, of course.